Part One: Pondering while Eating Toast: Bread Crumbs to Utility Pole. This journey traces our electrical power to its source – in three parts. How does the ubiquitous energy that we take for granted come to our homes? Where does it start? How does it happen? What’s all that stuff up there on the “utility” poles? 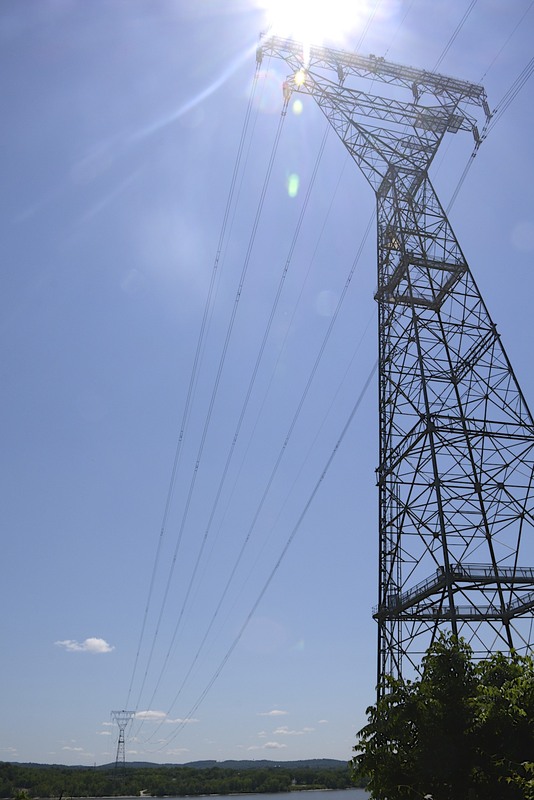 In my case a 35 mile (56 km) drive up to Tomkins Cove, NY, reveals these two enormous 475 foot (148 m) towers supporting 12 fist size cables across the Hudson River – freshly energized with something like 500,000 volts. No Time? Just view the images, which will appear in higher resolution when clicked. The captions tell the story. Walking Sandy Paws, the dog, most mornings, I find myself looking up at the utility poles with their strings of wires overhead, – everywhere – seemingly not much different than 120 years ago in the big cities. What’s up? So I grabbed my camera and did some investigating, starting with my morning toast. 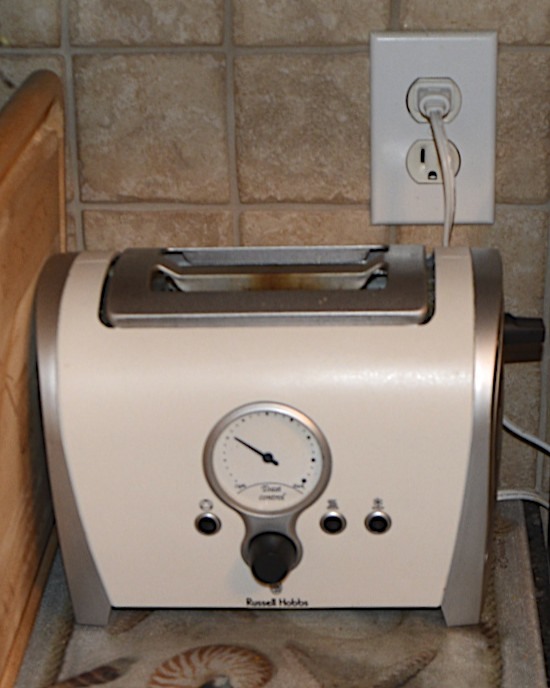 When the toaster is turned on, a circuit is complete across the heating elements which literally become “red” hot, and my bread is toasted. Yum! Technically –> Current is now flowing from the narrower (hot) slot of the wall outlet above [which is connected to one of two 120 volt wires entering the house’s service panel] to the “neutral” (wide slot in the outlet,) where, after effectively drained of voltage by the toaster’s elements, it dissipates residual to the earth. Painfully –>If YOU grabbed the hot and neutral wire, YOU would be toast! Wall outlets (for example) are wired to circuit breakers in the service panel which, in turn are connected to either one of two 120 volt lines entering the house… and the ground wire. 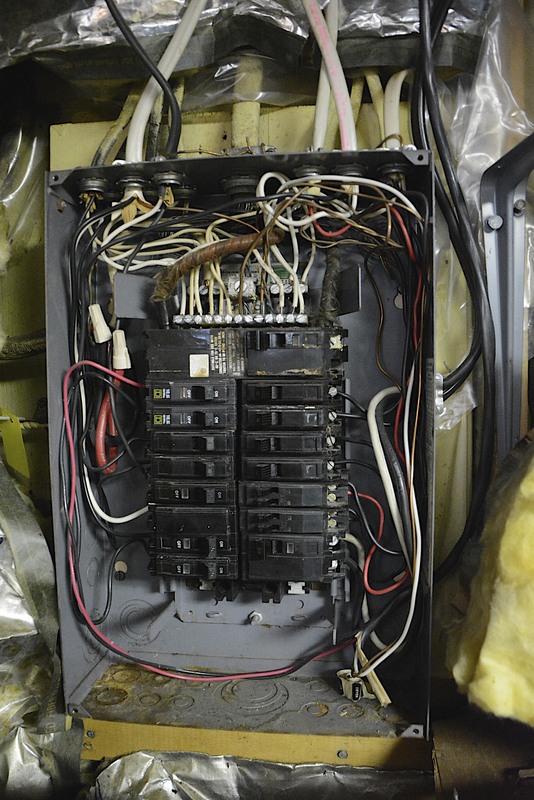 Seen here, those three wires enter via the yellow painted sheath above the panel, one of the 120 volt lines is seen (in brown fabric covering) inside the panel, coursing down and left above the white neutral (ground) wires. A similiar (black fabric covered) wire is to its right. (Click and enlarge for detail.) 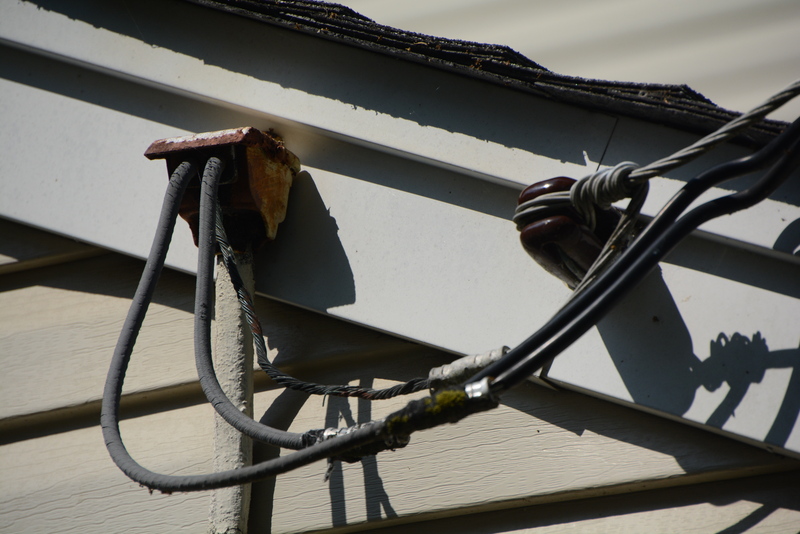 The bare ground wire from the yellow sheath is solidly attached to the panel itself, the neutral side of circuits, and in turn to the water pipes as an additional ground assurance. As long as either of the two feed wires and the ground wire are NOT connected, (from power plant to toaster) virtually no current flows. Painted yellow inside the house, here are the sheathed three wires, entering the foundation. 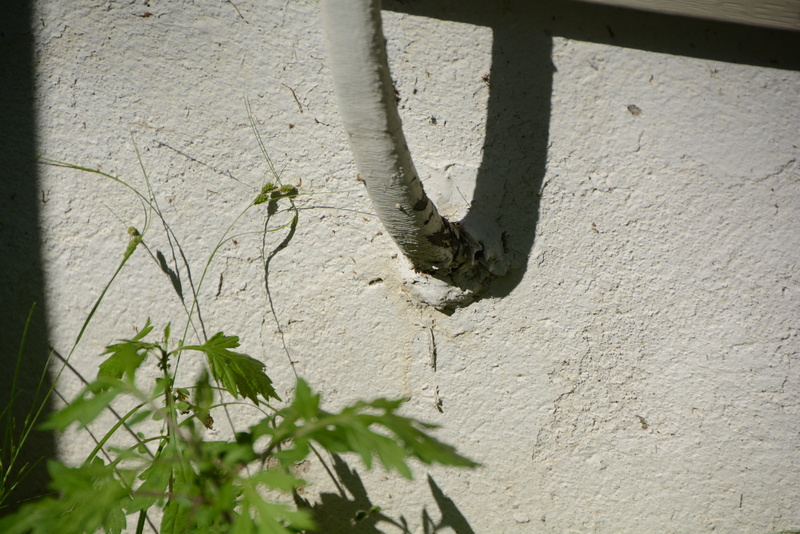 Attached to the side of the house, two insulated 120 volt lines and one bare ground wire enter the sheath together, coming from the pole on our street. 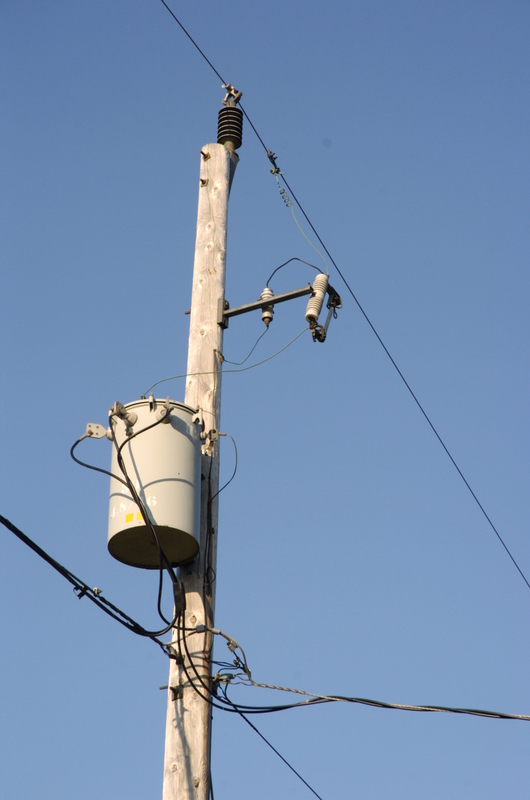 The three wires, twisted together, join (connect directly) with those of three other houses, and come from the pole’s transformer. Just to make it really confusing, all the wires are a mess up there on our pole but at least you can see a connector wire coming down from a single 7,200 volt line above into the top of the transformer. The windings in the can step the voltage down to two identical 120 volt lines, which along with the supporting ground cable, go to the house. See clearer image below. 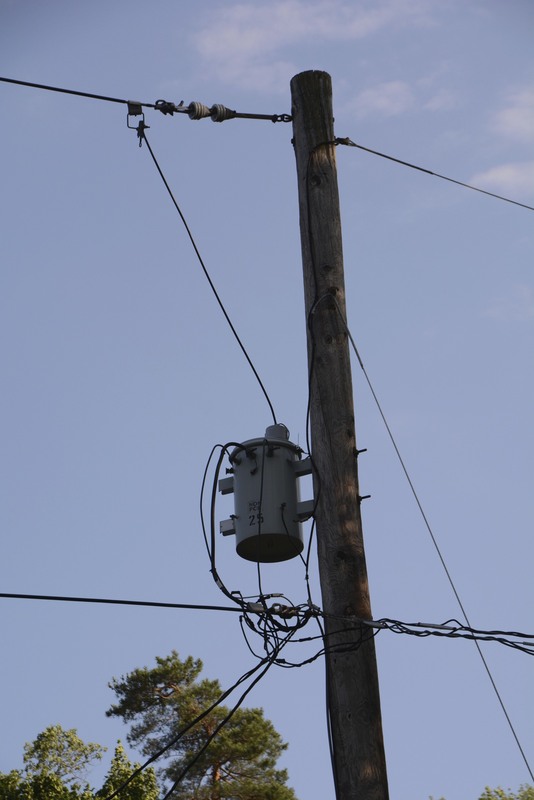 …So, right outside our home, a pole supports a 7,200 volt feed wire (it may be as high as 13,200 volts,) and transformer which steps voltage down to 120 volts and connects directly to our house. Disclaimer: Not being an electrical engineer or public utility employee, some values and circumstances may be slightly different than stated, but should give a general idea of the actual grid. Any system or statistical corrections will be most appreciated. Electrifying account of our current power supply path. Can birds sit on all parts of the poles, boxes and wires….and still live?